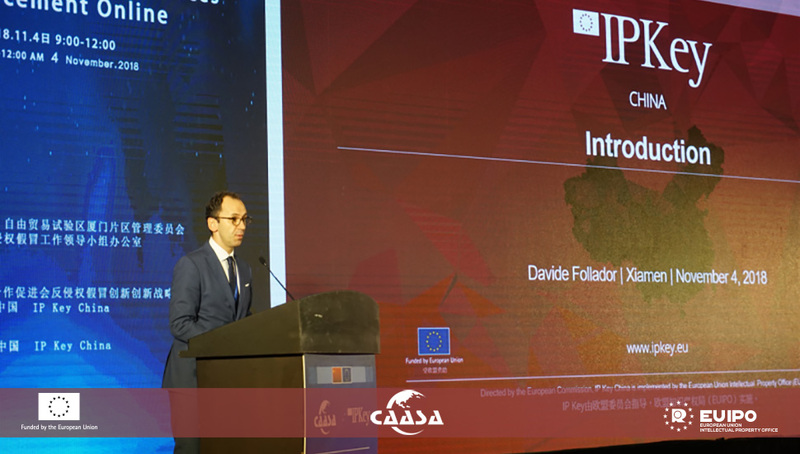 IP Key China partnered with CAASA (China Anti-infringement and Anti-counterfeiting Innovation Strategic Alliance) in the organisation of the 2018 EU-China Conference on IPR Protection Online and Innovation, which took place at Xiamen International Conference Centre (Fujian province) between 3-5 November 2018. The theme of the conference “IP Right Protection Online & Innovation” put the accent on the protection of IP Rights in the online environment, promotion of collaboration between Chinese and European IP Right owners and intermediaries in the development of international best practices. Throughout plenary opening ceremony, exhibitions and technical sessions, the event featured extensive discussions on: China’s E-commerce Law Reform; Industry perspectives on IPR Protection Online; Prevention of Counterfeiting Through Cooperation Tools; Proactive Measures by Platforms; Use of Blockchain, AI, big data in IP Right Protection Online; Protection of Trade Secrets; EU-China SMEs’ Exchange, and more. Around 50 speakers from Europe and China engaged in 9 different thematic forums, while approximately 400 participants - including government departments, international organisations, IP Right owners, service providers, domestic and foreign academic and industry representatives - attended this event. On the margins of the conference, IP Key China, Xiamen Intermediate People’s Court, Xiamen University Intellectual Property Institute and CAASA co-hosted an “IP Café” on 6th November, to discuss key issues in the protection of IPRs online. Policymakers and businesses in the EU and China can see 2018 as a noticeable step forward in China’s e-commerce landscape where IPR is concerned. Although the e-commerce law will require adjustment from platforms and enforcement agencies alike and will be enacted soon after a major reshuffle off Chinese government agencies and their responsibilities, the new law is doubtlessly a sign of a greater understanding of the e-commerce industry. The industry and its associated challenges, however, will continue to become more complex. Outstanding issues in the protection of IPRs on the Internet (e-commerce) revolve around the pursue of effective and consistent enforcement of laws and regulations throughout the country, where the cross-jurisdictional character of sales transactions taking place online pose additional challenges to IPR owners and law enforcement professionals. Social media platforms have emerged as disruptive and powerful avenues for new shopping experience, while their exponential growth and market diversification have not yet been matched by adequate IP protection policies. Issues of joint liability threaten to undermine legislation and enforcement. Therefore, framing the discussion in a way that can provoke an amenable approach from platforms and intermediary services is an important task for future cooperation endeavors. In the pharmaceutical sector, IP infringements mostly affect OTC products while illegal prescription drugs are mostly sold on the Deepweb/Darknet, yet there is still little transnational cooperation to tackle such phenomenon. More international harmonization of test and certification processes should be advocated, as well as in the evaluation of market prices, to the extent that criminal thresholds require certain values. From the legislative viewpoint, the recently adopted – and soon to be enacted – e-commerce law of China is an incomplete project, particularly in point of (a) joint liabilities of platforms and operators (b) balance of duties in the assessment of evidence and counter-evidence of infringement within notice & take-down procedures, (c) common IP standards across platforms, (d) cross-border e-commerce, (e) role of Internet intermediaries other than platforms in the fight against counterfeiting online.